This edited article about originally appeared in Look and Learn issue number 683 published on 15 February 1975. It was not the first time that Westminster Abbey had been the target of thieves but this time it was different. This time the three men creeping through the darkened building, ignoring the silent memorials to Britain’s heroes, were not after the Abbey’s treasures of gold, jewels, and silver. Their objective was a large lump of sandstone that is housed beneath the carved oak coronation chair. Outside the Abbey, waiting anxiously in a Ford Anglia, Kay Mathieson heaved a sigh of relief when she saw Ian Hamilton staggering across to her carrying a piece of the stone. “It’s broken in two,” he gasped as he bundled the stone into the car, only seconds before a police constable approached and asked what they were doing there at 5.30 in the morning. The two men remaining in the Abbey, Alan Stuart and Gavin Vernon, waited until Ian and Kay had driven off and the policeman had departed before they made their way to collect a second car to carry the larger piece of the stone. But when they reached the car they discovered to their horror that they had lost the keys. Meanwhile, Ian and Kay had returned to the Abbey, picked up the second piece of stone, and were heading out of London when, as luck would have it, they spotted their companions. As they sped away from the metropolis the four young students congratulated themselves on the successful accomplishment of their plan. But why should anyone want to go to all that trouble and risk simply to steal an unimposing lump of sandstone weighing 450lbs? It was a relatively easy question for the police to answer later that day as they examined the deep score marks made by the stone’s journey across the floor and carpets of the Abbey. The stone in question was more than just a stone. 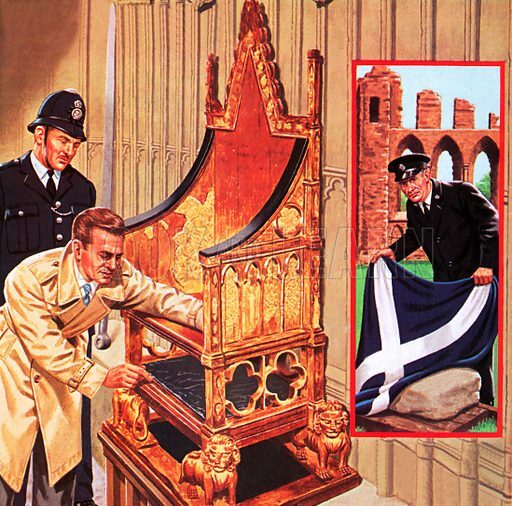 It was the Stone of Scone, a hallowed symbol of Scottish national feeling for up until 1296 it had been used in the coronations of the kings of Scotland. Legend has it that the stone was originally used by Jacob as a pillow. It was later taken to Egypt, then to Spain, and eventually to Ireland where, known as “Lia Fail” (Stone of Destiny) it became the coronation stone. King Fergus took it to Scotland for his own coronation and it was used in all subsequent crownings of Scottish kings until King Edward I brought it to England as one of the spoils of war. Thirty two years later, under the terms of the Treaty of Northampton in 1328, it was agreed that the stone should return to Scotland but this bargain was never kept. But now, on Christmas Day 1950, as the four students drove away from London, the Stone of Destiny was on its way home for the first time in 654 years. The British police were, however, soon on the trail and the stone had to be put into hiding although it was to take over three months of painstaking inquiry before they got close to the culprits. At this stage the people involved, unable to rally the people of Scotland to their cause, decided to return the stone. On 11th April, 1951 it was wrapped in the national flag of Scotland, the cross of St. Andrew, loaded into a wheelbarrow, and taken to the high altar of the ruined Abbey of Arbroath. Almost immediately the police took the stone into custody and returned it to Westminster Abbey where it remains to this day.